Fenway's Christopher Viveiros Honored By Kappa Psi Kappa Fraternity | Fenway Health: Health Care Is A Right, Not A Privilege. Fenway’s Christopher Viveiros Honored By Kappa Psi Kappa Fraternity | Fenway Health: Health Care Is A Right, Not A Privilege. Fenway’s Christopher Viveiros Honored By Kappa Psi Kappa Fraternity – Fenway Health: Health Care Is A Right, Not A Privilege. Fenway Health’s Director of Communications, Christopher Viveiros, was recently honored at the 5th annual Cata De Vinos fundraiser at Club Café in Boston. Cata De Vinos is organized each year by Kappa Psi Kappa Fraternity and benefits local organizations with missions that align with the Fraternity. Viveiros was presented with the organization’s prestigious Diamond Award. This award recognizes an individual that has helped the Lambda chapter with fundraising and supporting the functions of the chapter. 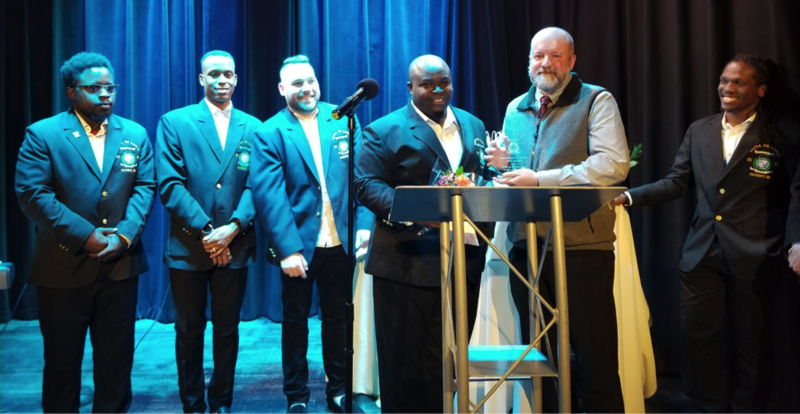 Other award recipients at this year’s gala included State Representative Liz Malia and James Morgrage, President of Harbor to the Bay and General Manager of Club Café, Boston. Please join us in congratulating Chris on this well-deserved honor!